Aids activists and opposition parties have criticised the sacking of South Africa's deputy health minister, after she went to a Spanish Aids conference. "This is a dreadful error of judgement that will harm public healthcare," said the Treatment Action Campaign (TAC). It is believed that President Thabo Mbeki did not authorise Nozizwe Madlala-Routledge's trip to Spain. She has previously clashed with her boss, the controversial Health Minister Manto Tshabalala-Msimang. Dr Tshabalala-Msimang is known as Dr Beetroot after urging those with HIV to eat beetroot and garlic, while the government has been condemned for not providing enough anti-retroviral drugs. Some 5.5m South Africans are HIV-positive - more than in any other country. TAC said the sacking of Ms Madlala-Routledge would further harm South Africa's fight against Aids. "It indicates that the president still remains opposed to the science of HIV and to appropriately responding to the [pandemic]," a TAC statement said. 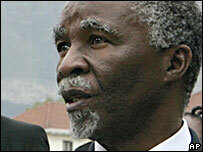 Mr Mbeki's statement on the sacking did not give a reason. Ms Madlala-Routledge's son, a consultant, accompanied her to Spain, at a total cost to the tax-payer of 160,000 rand ($22,850). Opposition parties have previously criticised government officials for taking too many foreign trips but they have also backed Ms Madlala-Routledge. "Ms Madlala-Routledge brought hard work, a love for freedom of expression and the ability to admit mistakes to the ANC government and she has been rewarded in such an outrageous way that a dark cloud will hang over our country tomorrow," said Independent Democrats leader Patricia De Lille. The main opposition Democratic Alliance said if Ms Madlala-Routledge was to be punished, so should other officials. "The fact is for the first time we had a deputy minister with a clear direction in the fight against Aids. Both the president and the minister are denialists, while the deputy minister has her feet stuck in reality," said DA health spokesman Mike Waters. "What it shows is that the president is a bully," he added, according to Reuters news agency. The BBC's Peter Biles says Ms Madlala-Routledge sprang to prominence last year when Dr Tshabalala-Msimang was off work for several months while undergoing a liver transplant. Ms Madlala-Routledge adopted a more open approach to the HIV-Aids crisis, and publicly took a blood test to check her own HIV status.